St. Paul's was architecturally constructed to have amazing acoustics, and our parish choir lets us fully experience these each week. The choir is made up of volunteers who meet weekly to practice and enjoy fun musical fellowship. 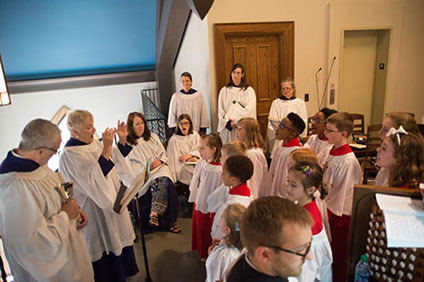 Led by our fabulously talented Mason Copeland, the choir enhances our worship on Sunday mornings for the 10:30 service, and at other special services throughout the liturgical season. Contact Mason Copeland with questions. A wonderful tradition for the children of St. Paul's, our children's choir is ably led by Dawn Harrison. "Ms. Dawn" provides not only musical instruction, but also a fun environment in which to glorify God through singing. Children from 2nd grade and up are welcome and encouraged to join.